Our congratulations to John W. Sexton, winner of the 3rd Five Words competition, for his poem The Dancehall on the Summit of the Bloodiest Head of the Twenty Six Headed Giant. 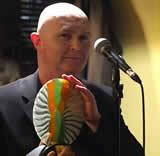 John will be the guest poet at Ó Bhéal’s 9th anniversary event on April 11th. Our congratulations also to all of the shortlisted entrants, and for highly commended entries from Beth Somerford and Janet Lees. Thanks to everyone who took part this year, and to judges Marie Coveney and Colm Scully for their careful and considered selection. These poems will appear in Five Words Vol IX, which will be launched at Ó Bhéal on Monday the 11th of April 2016, along with an award presentation and readings from available contributors. The 4th Five Words International Competition will commence at noon on Tuesday the 12th of April, 2016.